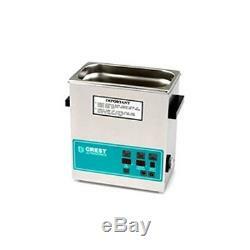 Crest CP360D Ultrasonic Cleaner-Heat and Digital Timer-1 Gallon Tank. The Crest CP360D is the 1 gallon cleaner that is equiped with a digital display for a 0-99 minute timer and thermostat that goes up to 175 degrees Fahrenheit (80 degrees Celcius). Cleans at an ultrasonic power of 100 watts on average at a frequency of 42 - 45 kHz. Also comes with a degas function.. Crest's Powersonic rugged industrial-strength performance gives you consistent quality at a benchtop price Crest's exclusive Power sonic feature ensures uniform cleaning throughout the tank by sweeping the ultrasonic frequency 3 kHz, creating overlapping ultrasonic waves. This eliminates inconsistent cleaning due to hot spots (areas of intense ultrasonic activity) in the cleaning solution, caused by the unvarying or "standing" waves produced by conventional ultrasonic power supplies. MORE POWER TO YOU When ultrasonic energy is introduced into a cleaning solution, cavitation, the foundation of ultrasonic cleaning, occurs. Ultrasonic energy causes alternating patterns of low and high pressure phases. During the low pressure phases, bubbles, or vacuum cavities, form. In the subsequent high pressure phases, these bubbles implode violently. Cavitation provides an intense scrubbing action that leads to unsurpassed cleaning speed and consistency when compared with simple soaking or immersion with agitation. Additionally, the bubbles are small enough to penetrate even microscopic crevices, cleaning them thoroughly and consistently. As a result, ultrasonic cleaning is one of the most highly effective and efficient methods you can use for cleaning a wide array of parts. Many features that add value to your investment have been engineered into Crest's benchtop cleaners. All stainless steel enclosures resist damage from chemical spills and will not crack. Adjustable, thermostatically controlled heaters (ambient to 80degreesC). Precise control of time, heat, power and degas on digital units. Crest ultrasonic technology has been used successfully in industrial and biomedical cleaning systems. That same high-performance technology has been transferred to the Crest Powersonic line of benchtop cleaners. Ceramically Enhanced Industrial Transducers, like those above, provide greater cleaning power and reliability compared to conventional wafer type transducers. THE DRIVING FORCE IS THE POWER SOURCE Although the industrial stack transducer has been acknowledged as superior in terms of reliability and performance, benchtop cleaners have always relied on wafer thin discs to produce ultrasonic energy. Crest has brought the superior performance of full-wave 45 kHz Ceramically Enhanced Industrial Transducers to the Benchtop line. What's more, all units are supplied with either 0-30 minute analog or 0-99 minute digital timers. And the heaters are thermostatically controlled. If you compare other benchtop cleaners, be sure to compare features... Because there really is no comparison. CLEANS LIKE NO OTHER BENCHTOP AVAILABLE! Frequency: 42 - 45 kHz. Overall Size: 11.5 x 6.375 x 11.625in / 265 x 162 x 295cm. Tank capacity: 1 gal / 3.8 liters. Tank Size: 9.5 x 6 x 4in / 237 x 134 x 150cm. Ultrasonic Power: 100 watts average. They sell fast & our inventory changes daily! Be sure to add me to your favorites list. Check out my other items. The item "Crest CP360D Ultrasonic Cleaner-Heat and Digital Timer-1 Gallon Tank" is in sale since Thursday, February 23, 2017. This item is in the category "Business & Industrial\Healthcare, Lab & Life Science\Lab Equipment\Cleaning Equipment". The seller is "10viking47" and is located in Willowbrook, Illinois. This item can be shipped to United States, to Canada, to United Kingdom, DK, RO, SK, BG, CZ, FI, HU, LV, LT, MT, EE, to Australia, GR, PT, CY, SI, to Japan, to China, SE, KR, ID, to Taiwan, ZA, TH, to Belgium, to France, to Hong Kong, to Ireland, to Netherlands, PL, to Spain, to Italy, to Germany, to Austria, IL, to Mexico, to New Zealand, SG, to Switzerland, NO, SA, UA, AE, QA, KW, BH, HR, MY, CL, CO, CR, PA, TT, GT, HN, JM.